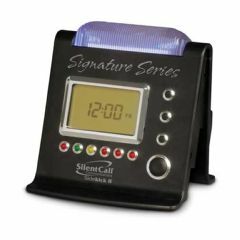 AllegroMedical.com presents The Silent Call Signature Series Sidekick II Strobe Clock Receiver. The sleek 418MHz Sidekick II Strobe Receiver uses radio frequency technology, allowing you freedom and flexibility with outstanding features and increased range of up to 2,000 feet. Quickly know when you have visitors, telephone calls or emergencies with the bright flashing strobe and distinctive LEDs. The Strobe Receiver will work with any Silent Call 418MHz transmitter for 24 hours notification of visitors, telephone calls or emergencies. What else do I need to make this work? This product will only work with 418MHz products in the Silent Call Signature Series. In order to be notified, you will need to purchase a Silent Call Signature Series Transmitter.